Interesting defensive shape was applied by Julen Lopetegui in his match against the brilliant, Pep Guardiola. A heavy-metal pressing system in his effort to stop Bayern deep build up. The outcome of this match, was astonishing as Porto managed to destroy Bayern 3-1. Lopetegui was playing his Porto team with several variant of pressing shape which was very flexible, depending on the area of press. One of interesting side, was Porto generally played their defensive shape in three different phases. It was the defensive system with the emphasis on pressing. Porto pressing phase 1. 4-2-4 used as their basic shape. A man to man oriented pressing system. Casemiro acted as the cover for any Bayern long ball and the free-man which was needed when Porto tried to create numerical superiority situation. When the ball was on Bayern’s defensive third, Porto pressed them with the basic shape of 4-2-4. Porto always tried to press Xabi, as he was the player who would be dropping deep, collected the ball, and built the attack. The ball was on the left side of the Bayern area. Bayern were seen to overload this area. They put five players there (Lahm, Thiago, Dante, Bernat, and Gotze). But, Porto, as seen on picture, managed to close the passing lanes. If Bayern could by pass this first phase pressing and reached the middle third, Porto would change their pressing shape, by transforming from 4-2-4’ish to 4-3-3’ish one. Porto pressing phase 2. The (early) middle third area, can be categorized as the “save” zone, the distance is quite far from Porto’s goal. It leads to a logical decision, when we saw Porto pressed with 4-3-3 and not drastically change their initial pressing shape (the 4-2-4) into a more extremely defensive shape. 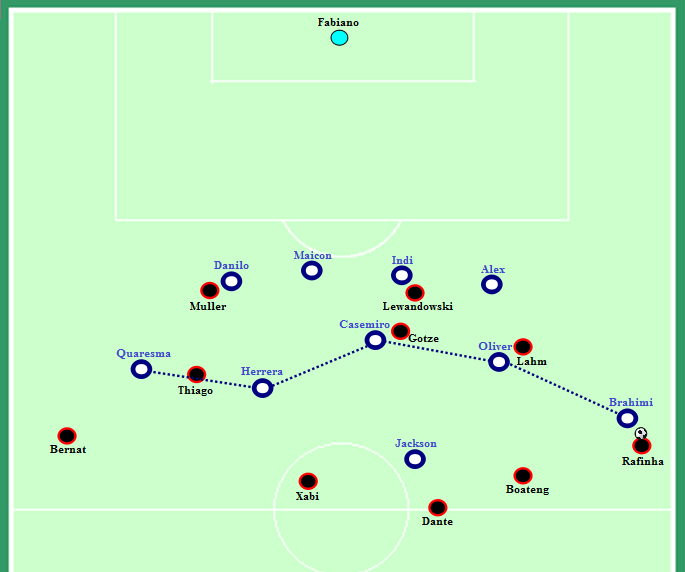 With 4-3-3 and, say, Porto managed to regain possession, it would be easier for them to transform into attacking shape and overloaded Bayern defence area, compared to if they pressed with 4-5-1, for the example. On the other side, This 4-3-3’ish looked to be safer for Porto regarding of their effort of securing the central area. By doing this Porto was trying to block the direct access to the zone 5. Their players’ concentration was good. The example, is Herrera who seemed to be able to keep his distance to Bernat and Porto central block as well. The third phase of pressing would be generated if Bayern players appoached Porto deeper area (zone 6, 5, 4, 3, 2, and 1). 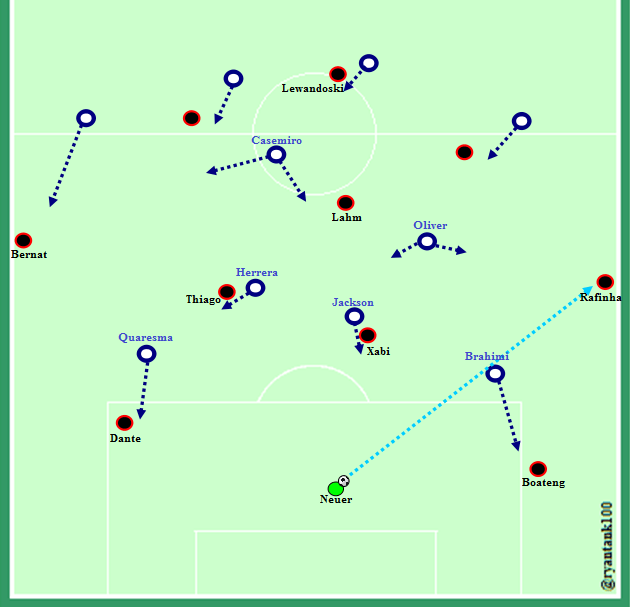 As Bayern were closer to the goal, Porto pressing shape was also transformed into a more defensive shape. 4-5-1. Porto pressing phase 3. With 4-5-1, the two Porto wingers would be closer to their full backs. So, they could drop deeper and help the defensive line to keep the “four men behind shape” remained compact. If Porto have to press Bayern on the wide area, then, then one of Quaresma or Brahimi would act as the main press. This 4-5-1 also allowed Porto to secure the central area with three players, which one of them stayed on the channel between two CB’s. Porto pressing phase 1, resulted a positive result, as Jackson Martinez forced Xabi Alonso to make mistake and took the ball under his control. In the second goal, it was the pressing phase 2 played its own part. Ricardo Quaresma pressed Dante, robbed the ball, and put the Portuguese in a direct situation of one on one against Manuel Neuer. The other interesting thing to see, was Bayern reaction in their respond to Porto high-block pressing. In normal situation, when the opponent played their high-block pressing strategy, Xabi would drop off, entered the same line with the defenders, made sure they reached the numerical superiority, and created better passing lanes. But, in this match, it was a difficult one to do. Porto pressed Bayern so well, they cut off the passing lanes. Bayern gave no chance to build their play from behind. Instead of creating better passing lane, by dropping to the back line, Xabi was creating harmful situation to the defense. Why? Because Porto made use of such build up tactic to gain the direct access to the deep of Bayern defense. It was never good for Bayern. So, how Bayern responded? Manual Neuer. Manuel Neuer. In respond to Porto pressing phase 1, as aforementioned, Bayern used Neuer to find the way through. When Xabi or one of Dante or Boateng received the ball, Porto pressing phase 1 would react by pressing them and forced them to make mistake. By using Manuel Neuer and took him to get involve in Bayern build up play, Bayern would have a spare player, a free player. If one of Porto advanced players put the immediate pressure to Neuer, it would create a “hole” and gave a better chance for one of Dante, Boateng, xabi, or Thiago to receive the ball and built the play. Pressing to Neuer could be done if (only) there was the proper timing and great chance to win the ball. In this moment (as you can see on the diagram), Neuer managed to find Rafinha on the right wing and bypassed Porto pressing phase 1, as well. Porto played with their pressing style, so did Bayern. Bayern pressing. Three men forward. When they managed to push Porto wide, Bayern played their touchline presing. They tried to overload that area. Bayern tried to create 2 v 1 situation or 3 v 2 pressing situation. In many chances, their pressing actually helped them regaining possession and opened the space for counter. But, Porto were so compact. Bayern got no many chances, particularly on the central area. 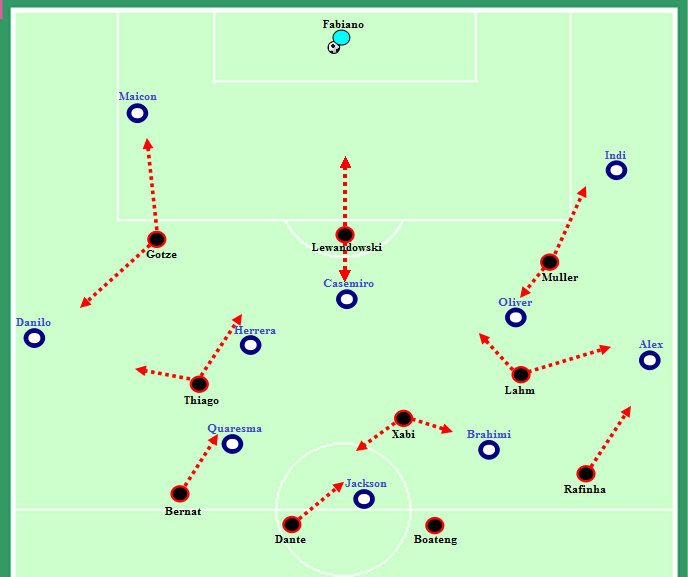 On the other side, the absence of Robben, Ribery, and Alaba, which caused Bayern losing the variant of their play, also played huge part of why bayern were so difficult to break Porto’s defence system. There was a moment that showing the need of Robben in a certain moment. Bayern managed to regain possession (2). The ball, in turn, was passed to Muller (3). Porto players reacted well and closed the space. As the chance to attack seemed to be “not so good”, Bayern “brake” their attack. Had it Robben there, he might be trying to beat Porto player in one on one situation. And, it might create some promising chances in Porto’s 16 box. But, it was not Robben. It was Muller. With Muller, as I had ever mentioned this before, Bayern attack is about positioning and movements. With Robben, Bayern will try to attack the opposing team with pace. Does it mean Robben is better than Muller? For some specific reasons and situations, yes. But, this is not about who is better. This is about the variation of play. This is about the flexible tempo of play, as there were different type of players. Bayern need it to open or break a stubborn defensive system. Bayern down to two goals in a short interval of time. It was a morale-booster for Porto, for sure. But, I don’t think such situation had put Bayern in bad situation and negatively-impacted to their play. I mean, Porto two early goals were not the only reason of why Bayern can’t develop their play and played some lovely, short-quick passing football. Bayern were struggle, yes. One to underline was, since the injuries of Robben, Ribery, and Alaba, Pep had “sacrificed” his juego de posicion. Pep, as he said, opted to change his own philosophy and adjust the tactic based on the available resources. Bayern were more direct. They launced more long balls from behind directly to the attacking line. In the match against Dortmund, this long ball passing was effective. Because, Lewandowski and Muller managed to deal with it well. They flicked the ball to the dangerous area or held the ball, bringing others into the play. But, not in this match, as Porto back line could anticipate it better than Dortmund did. But, again, it was not only down to the striker duo. Long ball passing has its own (natural) weakness, namely accuracy. And Porto managed to make use of this natural issue of long ball. Aside from the loss of their creativity upfront, as the consequence of the absence of Robery, Bayern also failed to show the function of their both wing backs, as how they were asked to play in the match against Leverkusen and Dortmund. In those matches, both Bayern wingbacks played in the basic shape of 3-5-2. One of their specific duty, was stayed wide to receive the ball, from deeper line, and made direct passes (as quick as possible) to the attacking line (Muller and Lewandowski). The wingbacks acted as something like wall-pass. In these matches, both wingbacks were playing in 3-5-2 basic shape. It put them on the position between the attacking line and the back line. it meant, they naturally on the potential position to be the catalyst of two lines. And easier for them to “receive and go”. It would be easier for Bayern to create more promising vertical plays from wide areas. In the match against Porto, they played from deeper position, two full backs in “four men behind” shape. Which potentially reduced their chance to position themselves between these two lines of play. Overall, Porto managed to display a constant pressing play throughout the match. They severally made interceptions deep in Bayern defence. Intense pressing everywhere. The third goal became the proof of how lethal and useful Porto pressing play was. In about one minute before Jackson’s goal, Porto managed to stop Bayern attack at zone 5. The ball was circulated, before reaching Alex Sandro. The Brazilian left full back released a long ball which, in turn, lead to the thid goal for Porto. Porto constant pressing was the key. It gave maximum result for them. As Philip Lahm said after the match, by opting to build the play form behind, it surely has its own risk, particularly when playing against a team playing with high-block defence and intense pressing. And Porto, were the team who managed to make use such risk. The pressing-resistance on some of Bayern’s players was observed. They was vulnerable under an intense pressure. On the other side, the only Bayern’s goal was also allowed by the defensive error. A low cross ball form Boateng, was supposed to be easier to deal with and intercept. But, it was the poorly positioning had failed it. Thiago Alcantara slotted the ball easily. On top of all, Porto properly played their football and deserved this win. This entry was posted in tactic and tagged Champions League, FC Bayern, FC Porto, Porto 3-1 Bayern, Ryan Tank. Bookmark the permalink.